Figure 7 Ecologists can estimate population size by making a sample count. Wildebeests graze on the grassy plains of Africa. 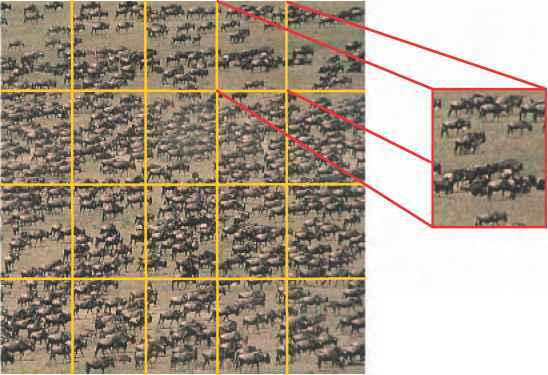 Draw Conclusions How could you use the enlarged square to estimate the number of wildebeests in the entire photograph? Sample Counts What if you wanted to count rabbits over a large area? 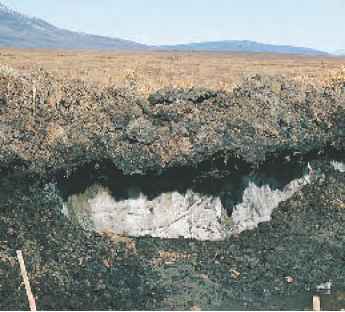 Ecologists use sample counts to estimate the sizes of large populations. To estimate the number of rabbits in an area of 100 acres, for example, you could count the rabbits in one acre and multiply by 100 to estimate the population size. Figure 7 shows another approach to sample counting. Limiting Factors One grass plant can produce hundreds of seeds. Imagine those seeds drifting onto a vacant field. Many of the seeds sprout and grow into grass plants that produce hundreds more seeds. Soon the field is covered with grass. Can this grass population keep growing forever? Suppose the seeds of wildflowers or trees drift onto the field. If those seeds sprout, trees and flowers would compete with grasses for sunlight, soil, and water. Even if the grasses did not have to compete with other plants, they might eventually use up all the space in the field. When no more living space is available, the population cannot grow. In any ecosystem, the availability of food, water, living space, mates, nesting sites, and other resources is often limited. A limiting factor is anything that restricts the number of individuals in a population. Limiting factors include living and nonliving features of the ecosystem. A limiting factor can affect more than one population in a community. Suppose a lack of rain limits plant growth in a meadow. Fewer plants produce fewer seeds. For seed-eating mice, this reduction in the food supply could become a limiting factor. A smaller mouse population could, in turn, become a limiting factor for the hawks and owls that feed on mice. Figure 8 These deer might have moved into a residential area because a nearby forest's carrying capacity for deer has been reached. Carrying Capacity A population of robins lives in a grove of trees in a park. Over several years, the number of robins increases and nesting space becomes scarce. Nesting space is a limiting factor that prevents the robin population from getting any larger. This ecosystem has reached its carrying capacity for robins. Carrying capacity is the largest number of individuals of one species that an ecosystem can support over time. If a population begins to exceed the environment's carrying capacity, some individuals will not have enough resources. 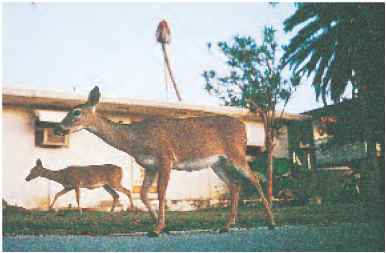 They could die or be forced to move elsewhere, like the deer shown in Figure 8. How are limiting factors related to carrying capacity? Do you have too many crickets? You've decided to raise crickets to sell to pet stores. A friend says you should not allow the cricket population density to go over 210 crickets/m2. Use what you've learned in this section to measure the population density in your cricket tanks. The table on the right lists the areas and populations of your three cricket tanks. How can you determine if too many crickets are in one tank? If a tank contains too many crickets, what could you do? Explain why too many crickets in a tank might be a problem. 1. Do any of the tanks contain too many crickets? Could you make the population density of the three tanks equal by moving crickets from one tank to another? If so, which tank would you move crickets into?